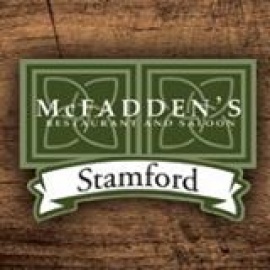 McFadden's Stamford CT Restaurant is open daily for lunch and dinner. It is a casual and friendly pub during lunch hours. The convivial early evening hours of McFadden's Saloon's legendary after-work events give way to a robust and bustling nightlife, with live DJ's every Thursday through Saturday. The DJ and attractive bar and wait staff are second to none and instrumental to the lively atmosphere, which makes McFadden's Saloon the perfect place to catch a game, dance the night away, host a corporate event, or celebrate a special occasion. Daily Special in McFadden's Stamford. Don't $1 beers taste so much better than regular priced beers? Enjoy $1 Drafts from 8-11 pm. A $20 open bar and $2 off appetizers from 6-9 is perfect for some after work bonding!